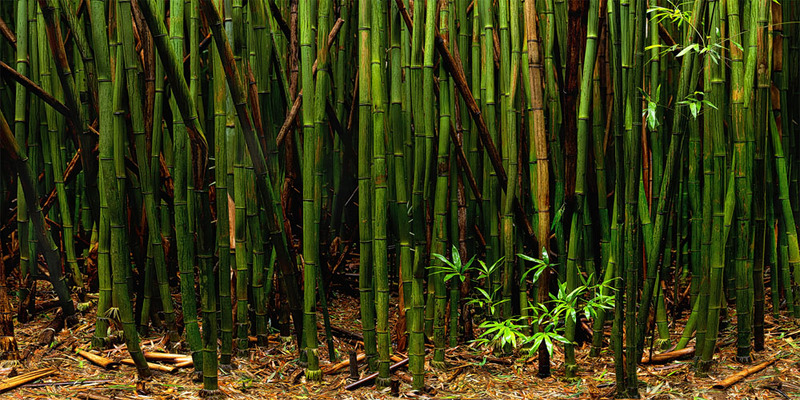 This bamboo "forest" is part of the Maui rainforest. For most of us, a rainforest conjures thoughts of lush colors, rich textures, earthy scents, spectacular and unique wildlife...and rain. But it is the humidity that allows this fantastic, planet-saving ecosystem to thrive and maintain its incredible environment. This "zen" scene was captured in a remote area along the Pipiwai trail on the steep eastern slopes of the spectacular Haleakala volcano, approximately two miles above the famed O'heo Gulch Pools, also known as the Seven Sacred Pools. To show this idyllic scenery at its best, this photograph is made up of 36 images, equating to about 375 megapixels for the full photo. The fully sized resolution shows such incredible detail that even the water drops on the bamboo stalks and leaves can be seen gracefully adorning this peaceful, beautiful setting.